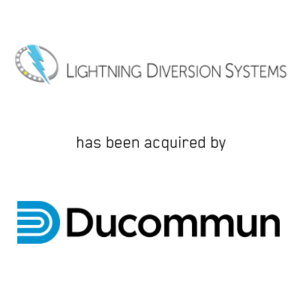 Irvine, CA (September 11, 2017) – Janes Capital Partners is pleased to announce the sale of LS Holdings Company, LLC, the holding company of Lightning Diversion Systems (“LDS”), to Ducommun Incorporated (NYSE: DCO) (“Ducommun”). Located in Huntington Beach, CA, LDS is a world leader in lightning protection systems using their proprietary technology for various applications serving the aerospace and defense industries. The purchase price was $60 million on a cash-free and debt-free basis and was paid in cash at closing. “This acquisition is part of Ducommun’s overall strategy to enhance top-line growth by focusing on advanced proprietary technology on various aerospace and defense platforms. I am pleased to welcome Dave Wilmot, the president of LDS and his team to Ducommun, and look forward to them being part of the organization,” said Stephen Oswald, Ducommun president and chief executive officer. “The business attracted considerable interest among prospective acquirers. Ducommun distinguished themselves as the right buyer for LDS on a number of levels. We wish them continued success with this outstanding business,” added Stephen Perry, CEO and Managing Director of Janes Capital Partners. Janes Capital Partners served as the financial advisor to Lightning Diversion Systems. BakerHostetler LLP acted as legal counsel for Lightning Diversion Systems.